The thermal neutron instruments at the NCNR are housed in the confinement building. One cold neutron instrument (MACS) is also located in this building. The thermal neutron scattering instruments have been replaced or modernized over many years. Improvements have been made with regard to safety and flexibility of operation, involving the installation of new monochromator drums which provide both a safer working environment and an improved signal to noise ratio. Beam apertures are remotely adjustable, and neutron-sensitive video cameras are used for sample positioning and alignment. The filter analyzer option on BT4 has been supplanted by a dedicated filter-analyzer instrument, in which the solid angle subtended by the detectors, and hence the useful signal, has increased by more than an order of magnitude. The greater sensitivity permits many new possibilities in spectroscopy in the (10-100) meV range, with resolutions of (1-2) meV. The triple-axis spectrometers allow the routine use of double- (i.e., both vertically- and horizontally-) focusing monochromator and analyzer assemblies, which can enhance signal by an order of magnitude in many types of experiments. Thermal neutrons are employed at the NCNR for a wide variety of applications other than neutron scattering, such as maintaining radiation and dosimetry standards, development of radiation detectors, and neutron activation analysis studies for the Food and Drug Administration, the Federal Bureau of Investigation, and a number of other government agencies, industries, and universities. 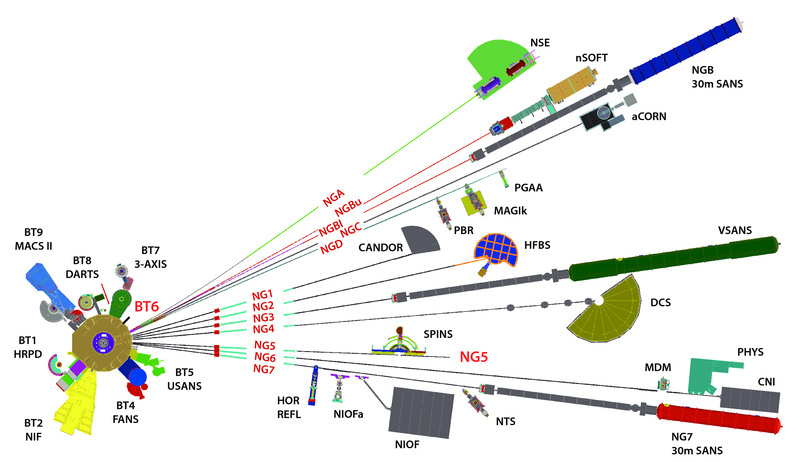 Twelve neutron guides transport neutrons emerging from the primary cold source through distances of tens of meters to the stations in the guide hall. Another cold neutron beamline terminates inside the confinement building, emanating from a small dedicated liquid hydrogen moderator that provides neutrons for an advanced multi-axis crystal spectrometer (MACS). The neutron guides work by a simple principle, i.e., total external reflection of neutrons from the nearly flat interior surfaces of long metal-coated glass tubes. Neutrons which graze the surfaces within a small angle (theta less than theta-c = 1.18 deg. for 10 A neutrons incident on Ni-58) are totally reflected because the index of refraction for neutrons is slightly less than one. The use of Ni-58 coatings in the oldest guides (NG-3,5,6,7) is dictated by their relatively large values of theta-c, an advantage for producing the highest possible neutron flux at the experimental stations (listed below). Three of the older guides (NG-1,2,4) have multilayer coatings on top and bottom surfaces which provide an additional factor of 1.7 in available neutron intensity. The newest guides (NG-A, B, C, D) also employ multiayer coatings and more complex construction (details), providing additional gains. *accessible through user proposals. These and the other instruments are also available for collaborative projects with NIST staff.